A former Vice President of Nigeria and the presidential candidate of the People’s Democratic Party (PDP), Alhaji Abubarkar Atiku, has called on the Federal Government to study and adopt the job and wealth creation module of Governor Okowa of Delta State. Alhaji Atiku made the call recently at a two-day Job Creation Exhibition for beneficiaries of the Delta State Government’s Job Creation Scheme held in Asaba from 24thto 25thJanaury, 2019. The job Creation Exhibition which is the second of its kind in the state was attended by about 700 beneficiaries, comprising entrepreneurs trained and established through the Skills Training and Entrepreneurship Programme (STEP), Youth Agricultural Entrepreneurs Programme (YAGEP) and by those from the Graduate Employment Enhancement Programme (GEEP), Women Mobilization, Micro Credit Akwa Ocha/Leather Works and Vocational and Technical Education Board (TVEB). Represented at the event by his running mate, Mr Peter Obi, Alhaji Atikulauded the job creation initiative of Governor Okowa while on a tour of the Job Creation Exhibition stands of the beneficiaries. The PDP presidential flag bearer commended Governor Okowa’s administration for the initiative, assuring Nigerians that his administration would explore sustainable means to create wealth for Nigerians. “There is no better evidence of this assertion than the scores of previously unemployed youths who have become successful entrepreneurs and are here today to exhibit their products and services. 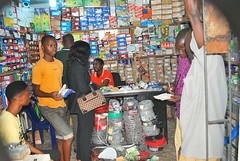 4, 253 previously unemployed youths have become business owners across various skills areas, notably Catering & Confectionery; Decoration & Event Management; Hairdressing & Makeover; Cosmetology; Electrical Installation & Repairs; Tiling; Plumbing; Fashion Design & Tailoring; Agricultural enterprises as Piggery; Fish Production; Poultry; Crop Production among other enterprises,” he remarked. While noting that the job creation efforts of his administration is a resounding success, Governor Okowa congratulated the beneficiaries of the programme for the success stories, he said some entrepreneurs raised by the programme had become employers of labour which multiplier effects on the family and that of the state remained significant,assuring that the number of beneficiaries will triple in the next four years.. Earlier the Honourable Commissioner for Finance and Chairman of the Job Creation Steering Committee, Dr. Kingsley Emu, thanked Governor OKowa for his commitment to creating jobs for Delta unemployed youths. On his part, the Chief Job Creation Officer, Prof. Eric Eboh, urged Deltans to patronize the products and services of the exhibitors. Delta State Government through its Youth Agricultural Entrepreneurs Programme (YAGEP) has trained and established a total of seven hundred and eighty two (782) unemployed youths in various agricultural skills particularly in poultry, piggery, fishery and crop production across the state. 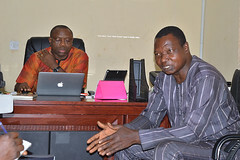 The Chief Job Creation Officer, Prof. Eric Eboh, disclosed this during a media tour to YAGEP Farm Clusters at Deghele, Ugbokode-Okpe and ADP, which he said the essence was to show the extent Governor Okowa’s administration was succeeding in using the job creation scheme to empower Delta youths, noting that the programme had run for three cycles and about to commence the fourth one. According to Prof. Eboh, YAGEP is an integral element of twin strategy to solve youth unemployment and transform agricultural value chains in the state, pointing out that the training cuts across graduates, school leavers and persons with disabilities. He said that the state has established a total of 25 farm enterprise clusters with the YAGEPreneurs as owners and managers of the enterprises across the state. Prof. Eboh explained that these farm enterprises and clusters are vital for sustaining youth interest in agriculture and demonstrating improved agricultural technologies and practices and promoting enterprise viability as well as ensuring high levels of agricultural productivity and sustainability in the state. He pointed out that the government of Senator Dr. Ifeanyi Okowa was succeeding in its use of agricultural value chain to affect the lives of Deltans as the cluster model is yielding desired impacts in transforming the agricultural landscape and agricultural prosperity in the state. At Deghele YAGEP Rice Farm Cluster which was established in 2018 in Sapele Local Government Area, the Chief Job Creation Officer, Prof. Eboh disclosed that the YAGEP rice farm occupied an expanse of forty-two hectares of land allocated to 21 YAGEPreneurs trained in Rice Production. At Ugbokodo-Okpe YAGEP fish cluster in Okpe Local Government Area, Prof. Eboh also took journalists round the 244 fish ponds. He described Ugbokodo YAGEP Fish Farm Cluster as the largest fish cluster in the state. While assuring them of government assistance at all times, he advised the YAGEPreneurs to live in peace with their host community, noting that the fish ponds were established with 154 fish ponds last year with an additional 90 ponds this year for a total of 122 YAGEPreneurs trained in Fish Production. Speaking to the journalist in an interview during the visit, Mr. Victor Ukereti and Baya Gbayafabor, beneficiaries of the YAGEP programme commended the state for evolving such a laudable agricultural programme in the state. They called on youths to embrace the various developmental efforts of the state government and appealed that the programme be sustained in order to extend the training to other youths in the state. In continuation of the media tour to the Agricultural Development Programme (ADP) in Oshimili North Local Government Area, the media team were also conducted round the 81 in-door tarpaulin fish tanks allocated to 27 YAGEPreneurs engaged in the 2017/2018 cycle. Each YAGEPreneur in Fish Production was given 3 in-door tarpaulin fish tanks, 145 sbags of fish feeds of various sizes in tranches, 2000 juveniles, N15, 000 naira stipend for 9 months among other facilities. The all-inclusive leadership style of the Delta State Governor, Senator Ifeanyi Okowa, was once again brought to bear with the empowerment of a family of five sisters living with disabilities through the state government’s Skills Training and Entrepreneurship Programme (STEP). Presenting starter packs to two members of the family, Chinedu Okolie and Amana Okolie on behalf of the state government at their family compound at Ogbeowelle Quarters, Ibusa in Oshimili North Local Government Area, the Coordinator-STEP, Mr Onyeisi Nkenchor, said their engagement in the STEP programme is a demonstration of Gov. Okowa’s commitment to taking youths off the streets into meaningful enterprises. He pointed out that a total number of 3,069 youths have benefitted from the Job Creation Scheme through the Skills Training and Entrepreneurship Programme (STEP) and the Youth Agricultural Entrepreneurs Programme (YAGEP), out of which 81 one of them are Persons with Disabilities (PwDs). He emphasized that these facts are proofs of Governor Okowa’s all-inclusive leadership style to engage youths meaningfully irrespective of status, whether physically challenged or not. He recalled that the Governor has responded promptly to Linda Okolie’s call for government’s assistance to her family. “It will interest you to know that the Okolie sisters, namely Chinedu, Amana, Franca, Rita and Linda have successfully trained themselves in Fashion Design & Tailoring and in Hairdressing and Makeover. As a result, Chinedu (Fashion) and Amana (Hairdressing) were enrolled for a refresher course in the Brown STEP to improve their proficiency. Like their counterparts, they are being presented their starter packs today and will begin to enjoy what others are enjoying,” he stressed. Responding on behalf of his siblings, Linda Okolie, expressed their gratitude to the state Governor for the wonderful works he is doing in the state, especially for coming to their aid, the family of 5 physically challenged sisters, praying God to bless him. Also speaking, a member of the extended family, Madam Comfort Okolie, who expressed shock over the Governor’s magnanimity commended him for the training and the starter packs presented to her orphaned nieces, stressing that this singular act is a clear indication that Governor Okowa is a governor for all. 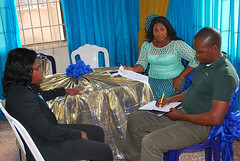 Beneficiaries of the 2018 Cycle of the Skills Training and Entrepreneurship Programme (STEP) and the Youth Agricultural Entrepreneurs Programme (YAGEP) have commenced another round of training tagged, ‘Entrepreneurship and Business Management Training’ (EBMT) in continuation of the packages lined up for beneficiaries of the Delta State Governments job creation programmes. The three days training taking place at Songhai Delta, Amukpe is to engage the 2018 Cycle beneficiaries of STEP and YAGEP who have completed their three months vocational training of their chosen skills in the various training centres spread across the state. 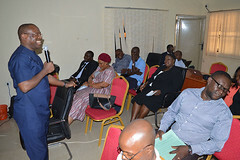 Giving an overview of the training, the Chief Job Creation Officer, Prof. Eric Eboh, said that EBMT was one of the three components packages of the job creation programme and that it was to engage beneficiaries on how to successfully start, manage and grow their enterprises as start-ups. He outlined the other components as the Orientation and Personal Effectiveness Training (OPET) and the Practical Skills either vocational and agriculture training. Beneficiaries engaged in the training included those in vocational skills (STEP) such as Tiling, Plaster of Paris (POP), Interlocking, Catering and Confectionary, Hairdressing and Makeover, Audio-Visual Technology, and Decoration and Event Management. Those in YAGEP were trained in Rice Production, Fish Production and Vegetable/Tomato Production. He remarked that their counterparts in Electrical Installation and Repairs, Plumbing, Fashion Design and Tailoring, Information Communication and Technology (ICT,) Welding and Fabrication whose training duration was for six months were still on training in their vocational training centres. He noted that seasoned resource persons had been engaged to help them with practical tips on how to overcome challenges that could arise as start-ups, stressing that the first three years of any business was very critical. He encouraged them to use the opportunity of the training to build relationship and network among themselves so as to grow faster. Others were Principles of Keeping Basic Business Records and Accounts, Exercises in Keeping Basic Business Records and Accounts and Starter Pack is Vital, A Difference with Starter Pack is PLUS. Job Creation: Delta State Government to Engage 1420 Unemployed Youths in the 2018/2019 Cycle. Delta State Government is to engage not less than 1, 420 previously unemployed youths in its 2018/2019 job creation programme through STEP and YAGEP. 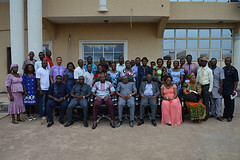 The Chief Job Creation Officer, Prof Eric Eboh, disclosed this during a one-day workshop organised for Brown STEP trainers by the Office of the Chief Job Creation officer in Asaba. The Brown STEP trainers who were 141 in number covered various enterprises such as Welding & Fabrication; Aluminium Works; Fashion Design & Tailoring; Catering & Confectionary; Bead Making; Decoration & Event Management; Hairdressing & Makeover, Interlocking, Tiling & POP including eight STEPreneurs who have grown to become job creation trainers. Prof Eboh said the 2018/2019 Cycle which is the 4thcycle will consist of Brown STEP, Green STEP and Brown YAGEP. He congratulated them for their selection as trainers for the 2018/2019 Cycle, stating that the Skills Training and Entrepreneurship Programme has been upgraded into two categories, Green and Brown STEP. He described Green STEP as beneficiaries who do not have knowledge of the trade but are desirous of acquiring the skill over a period of time depending on their choice enterprise. On the other hand, he explained that Brown STEP category are those harvested from their training centres and those who have trained themselves through personal sponsorship, but require refresher course and assistance to be established in their chosen enterprises, adding that the training/refresher course for the Brown STEP category would last for six weeks. While commending them for their contributions to the success of the programme, he advised them to abide by the code of conduct guiding the programme and to uphold the ethics of quality, discipline and integrity which the programme is known for. He affirmed that since inception of the programme in the past three years, a total of 3069 unemployed youths have been trained and established in their choice enterprises while another 1,420 youths are to be engaged in the 2018/2019 Cycle. He said the job creation programme has gained both national and international recognition with the revalidation of the 2017/2018 Cycle for partnership through World Bank/European Union assisted SEEFOR projects. The workshop featured question/answer and technical sessions. Governor Ifeanyi Okowa has disclosed that the Delta State Government is collaborating with the State House of Assembly to institutionalize the Job and Wealth Creation Scheme. Governor Okowa made the disclosure at the Induction Ceremony for the 2017/2018 beneficiaries of the state government’s job creation programme, the Skills Training and Entrepreneurship Programme (STEP) and the Youth Agricultural Entrepreneurs Programme (YAGEP) in Asaba. The inductees numbering 745 beneficiaries included 209 Brown STEP, 347 Green STEP, 159 YAGEP and 30 Persons with Disabilities (PwDs) in the third cycle of the programme. He said ‘’plans are on to present a bill before the State House of Assembly for the establishment of a Job and Wealth Creation Empowerment Law. “I hope that the programme continues in government even when I have left office. If we continue with it as a state, after 10 years the multiplier effect will be felt”, he enthused. He advised them to network among themselves with the view of building a network of young entrepreneurs to drive the economy of the state. While disclosing that the state government would soon embark on the 4th Programme Cycle of the STEP/YAGEP Programmes, he charged them to be disciplined; honest; innovative; resourceful and hardworking; committed and determined in order to succeed in their various enterprises. 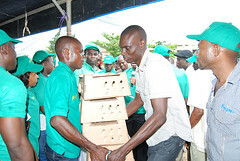 He also enjoined them to be role models for youths in their communities and to remain good ambassadors of the programme by training other youths to become self-reliant and employers of labour. According to him, “As a government, I urge you to stay in the realisation that you stand out among youths as many will look up to you, you are a role model to other youths in the society, you have to put in a lot of commitment through hard work and honesty, stay patriotic to yourself and Delta State and you will succeed. Challenges will come but if you stay committed, you will be successful”. “I congratulate you on the successful completion of your training programme, you are privileged to be ambassadors of this programme, once you step out, the world looks out for what you will become, and do with yourself; you should be an embodiment of the programme in character and deed.”, he added. On his part, the Chairman, Job Creation Steering Committee and the Hon. Commissioner for Economic Planning, Dr Kingsley Emu, represented by the Hon Commissioner for Youths Development, Hon. Karo Illolo, said the job creation scheme is hinged on sustainability and development through monitoring and mentoring. Earlier in his address of welcome, The Chief Job Creation Officer, Prof. Eric Eboh, explained that the third programme cycle of 2017/2018 has 745 beneficiaries including 30 PwDs, pointing out that their training and starter packs were funded by the World Bank/European Union assisted State Employment and Expenditure for Results (SEEFOR) projects. Prof Eboh recalled that among the 30 PwDs were 5 sisters from Ibusa who were enrolled into the programme at the instance of Governor Okowa when he encountered them at the Town Hall Meeting at Akwukwu-Igbo last year. The ceremony featured cultural dance and choir presentations by the beneficiaries. Among the dignitaries present at the ceremony were the Speaker of the State House of Assembly, Rt. Hon Sheriff Oborevwori and other top government functionaries.